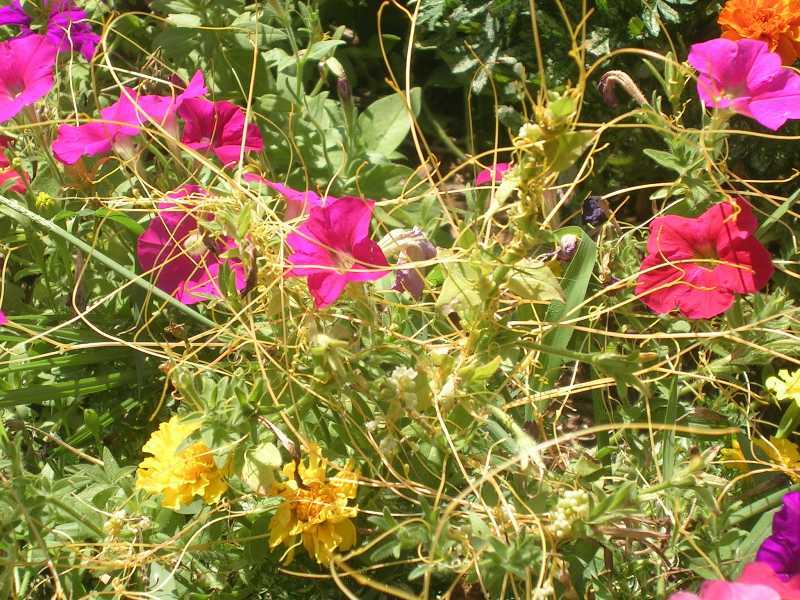 Dodder is an annual seed-bearing parasitic vine in the dodder family (formerly placed in the morning-glory family). Its thin, thread-like, yellow or orange stems grow rapidly entwining and covering their host plants. Cuscate is the most common genus and is found throughout the US and Canada. Of the 50 species that occur, most are found in tropical and warm-temperate areas but some species also occur in cooler areas including St. Louis where they can grow from seed each year and infest herbaceous and small woody plants. 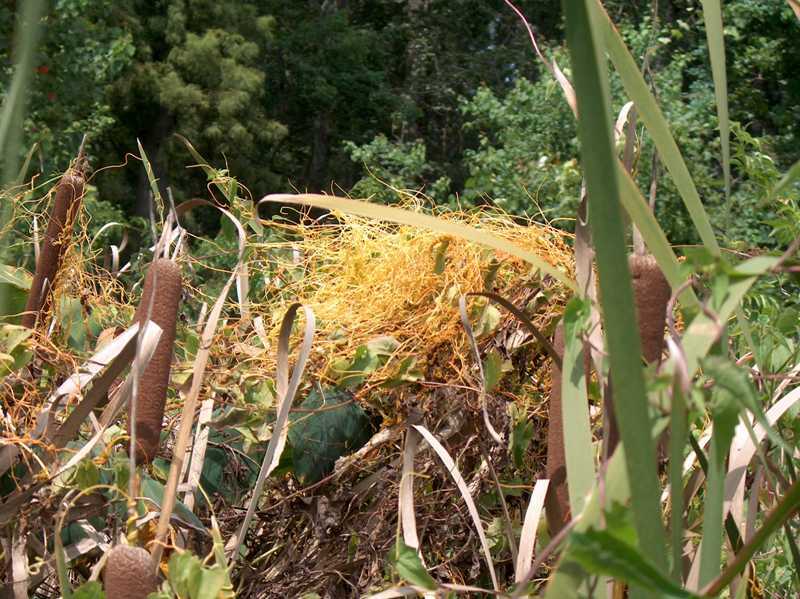 Since seeds can be difficult to separate from some agricultural crops dodder has been spread widely through agriculture. Dodder seeds germinate in soil and can live on their own for 5 to 10 days until they are about a foot tall. If they have not found a suitable host by this time the seedlings will die. Seedlings that find a suitable host twine around the plant and insert haustoria (modified adventitious roots) into the tender stem. The haustoria penetrate and tap the plant's vascular system for water, minerals and nutrients. Plants are weakly photosynthetic, but most produce very little food on their own. They rely upon their host plant for survival. As the vine taps the host plant its connection to the soil is severed. Small, white, bell-shaped flowers form in late summer and early fall and can produce copious amounts of seed. Plants are annual and are killed by frost. Plants regrow from seed each year. 1. Remove the plants. 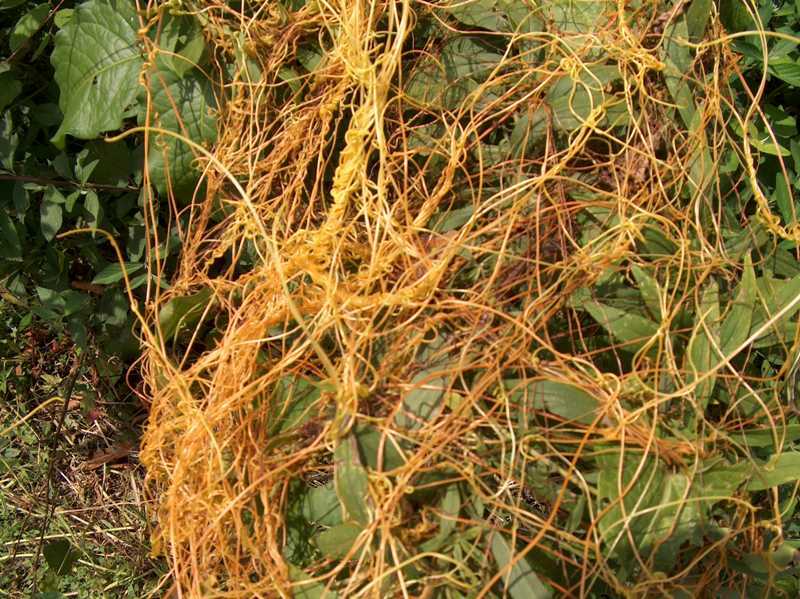 As soon as the thin vining stems of dodder are observed they should be gathered and removed before seed is set. Removal of the host plant is usually recommended. Complete eradication from the host plant is usually not possible. 2. Scout for and remove new seedlings as they appear. 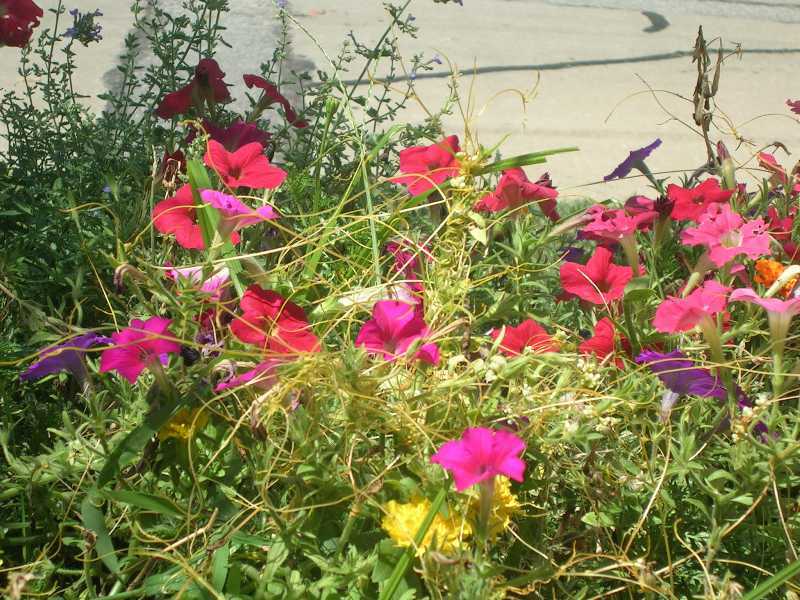 Monitor areas previously infested with dodder closely and pull young seedling before they attach themselves to new plants and certainly before they set seed. Seeds can survive in the soil for more than 20 years. 3. Treat with an herbicide. Dodder and the host plant can be killed by treating with glyphosate, a non-selective herbicide. As a follow-up measure to kill germinating seeds, treat soil with a preemergent herbicide such as Dacthal before seeds germinate in spring. Strategies 1 and 2 are strictly organic approaches.